1. In a bowl, combine sugar, milk and preserves. Stir until sugar starts to dissolve. 2. Add heavy cream, vanilla and cherry concentrate. Stir until well blended and sugar is completely dissolved. Add in chocolate chips and stir. They will sink but as you stir the mixture while it freezes they will mix in better. 3. Freeze according to manufacturer’s instructions in your icecream machine. oh yum! 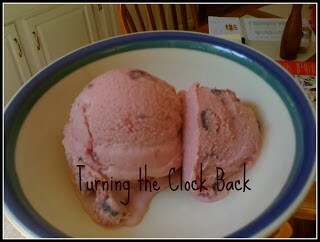 i am doing a post about ice cream, i think i'm going to include this one!